Jean Paul Gaulter for Hermès, Fall 2010. I know I mostly highlight dresses and gowns here but in my day-to-day life, it’s me and pants all the way. They’re comfortable, work with my lifestyle, and I forever love the way you can make them feminine or masculine by what you pair them with. Two designers, Jean Paul Gaultier and Yves Saint Laurent, whose masculine/feminine work is now on view at The Museum at FIT as part of the exhibit Fashion, A-Z: Highlights from the Collection of The Museum at FIT, Part Two, called out for a pairing in a post, even if they reside in different parts of the gallery. The older I get the more I love Jean Paul Gaultier, oh he of the cone bra corset Madonna wore during her 1990 Blonde Ambition tour—an updated version of which she is sporting right now during her current MDNA world tour. The more I see of Gaultier’s work the more I understand how very talented and wonderful he is. In addition to his own line, which has an honest-to-God haute couture designation, he was creative director at Hermès from 2003 to 2010. I absolutely love the ensemble above, which he designed for Hermès in Fall 2010. Madge in 1990 in her Jean Paul Gaultier-designed cone bra corset. Love! Madge now in her latest Jean Paul Gaultier-designed cone bra corset. Also love! As for Yves Saint Laurent, he who gave us Le Smoking and the Safari jacket, I know this suit is from 1967 but I would love it if, sometime in October, I caught a glimpse of a long and lean lady striding down 5th Avenue (near 57th Street so our friend Bill Cunningham could snap a shot of her!) wearing this ensemble. Superb! A 1967 Yves Saint Laurent (Rive Gauche) suit of navy pinstripe wool knit. I do believe this lady is wearing the same suit. 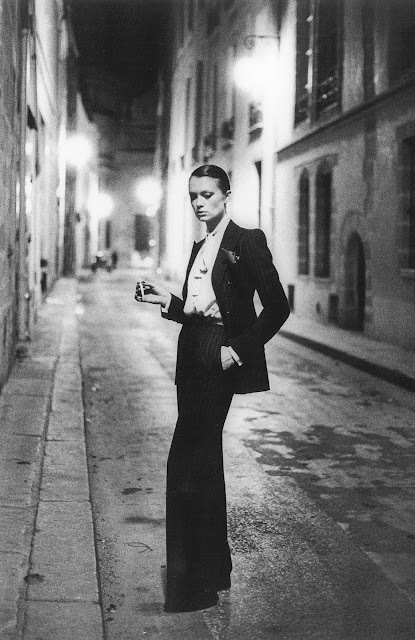 Photo by Helmut Newton. I read recently that the company Yves Saint Laurent is becoming “Saint Laurent Paris” and moving their design studios from Paris to Los Angeles to suit new creative director Hedi Slimane. I’ll try to keep an open mind but I think this is terrible news for the brand. A name change? Paris to Los Angeles? Really? If you would like to see some of the designs that made him famous, head on over to FIT. Fashion, A-Z: Highlights from the Collection of The Museum at FIT, Part Two is on view until November 10, 2012. Name change? O.k., it's not Yves anymore, after all. But Paris to L.A.? Noooo! I can't see how this could be a good thing. This reminded me that I have seen from several designers and retailers that menswear is once again big this fall. I love the suited, pinstrip look with a feminine touch! But, the Madonna look, I can do without!! I'm kind of sad about the Yves Saint Laurent name change too - they didn't change Chanel when Coco died so why strip off Yves? Glad you feature John Paul Gaultier - one of my faves! I like the long length of the jacket with the pants suit! I saw this at FIT yesterday; the Hermès suit looks like, half Doctor Who, & in a good way.